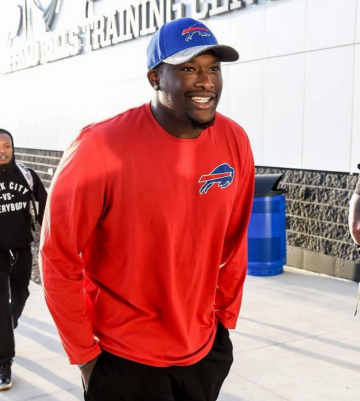 Karlos Williams says he indulged in his partner's cravings—and packed on the pounds because of it. Have you ever found yourself indulging in a pregnancy craving only to look over and find your partner stealing your French fries or chomping on your pickles? If so, you're not alone. Many dads-to-be report gaining a few pounds during their partner's pregnancy—and even professional athletes are guilty of it. Karlos Williams, a Buffalo Bills running back and father of four, recently came back to training camp carrying a few additional pounds. According to his coach, the athlete was "clearly overweight." The reason? "The injury of pregnancy I would say," Williams divulged to reporters, according to ESPN's Mike Rodak. "I like to eat and then [my fiancee] being pregnant gave me an excuse to eat, so [I was] eating anything and everything," Williams said. "She'd wake up, 1 or 2 o'clock [and say], 'I want a snack.' Well, I'm not going to sit here and watch you eat because I don't want you to feel bad." So, the pair raided the fridge together, but since welcoming their son, Kayson Jefferson Williams, that's all over. "It's back to football," Williams confessed. "She's getting back to working out herself, so [we're] kind of motivating each other, feeding off each other's energy." From the looks of this adorable pic of Williams and his son, his dad bod's not so bad! Williams might want to be careful in the coming months, though. A 2015 study by Northwestern Medicine found that new dads gain an average of 3.5 to 4.5 pounds after their babies are born. We'll just chalk that up to life being fair for once!